In 1909, the Buffaloes were part of the St. Louis Browns farm system. By 1910, the following Buffaloes were playing for the St. Louis Browns: Roy Mitchell (P), Jim Stephens (C), Frank Truesdale (2B), Patrick Newnam (1B), Hub Northen, Joe McDonald, Art Griggs, Dode Criss, Alex Malloy, and Bill Killefer. Houston, Tex., Feb. 14, 1909: Preparations were underway to welcome Charles William Eliot to the city on March 2nd. Eliot was then in the last of his 40-year term (1869-1909) as president of Harvard University. A.H. Jayne, a local graduate, was organizing a “genuine college welcome, with yells, snake dances and night shirt parade.” Houston had no university in 1909, and this was given as the reason why Houston “has more real enthusiasm for such things than any other town in the South.” The Pan Hellenic Association of Houston and the “‘Barbarians'” were planning to participate in the welcome. Houston, Tex., Feb. 14, 1909: Houstonians were also preparing for a March 8 week-long conference of Woodmen of the World representatives from Texas, New Mexico, and Arizona. The 3500 Woodmen “camps” in those three states comprised some 150,000 members, the 1000 Woodmen “groves” in those three states represented another 50,000. 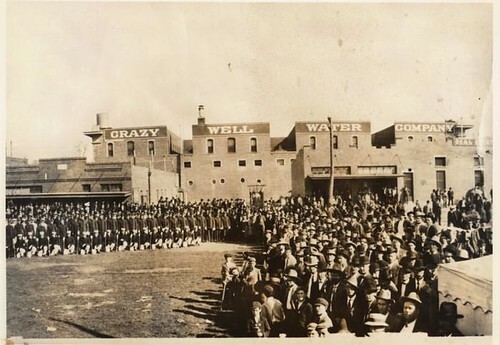 The program of special events included an opening banquet at Sauter’s Cafe, competitions, speeches, a March 9 parade with 16 “elaborately decorated” floats, a memorial service, and a closing “smoker” [barbecue?]. At the time, Houston had nine Woodmen camps: Red Oak (700 members), Black Jack (135), Post Oak (140), Poplar (172), Laurel (70), Willow Tree (75), Pine Tree (135), Old Hickory (70), and Magnolia Camp No. 13 (the oldest Houston camp) (400). It also had six groves: Hollywood, Post Oak, Willow Tree, Ellen D. Patterson, Poplar, and Magnolia. This entry was posted in 100 Years Ago, Sports. Bookmark the permalink. Better late than never. A “smoker” could be a boxing match. They still had them when I was in the Navy in 1970.